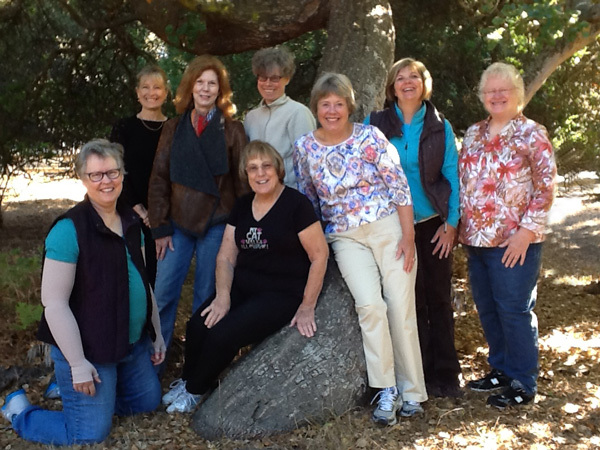 Jane's sewing students had another successful sewing vacation in Pacific Grove,California this Fall. Everyone was very relaxed , the weather was gorgeous and the food delicious. Each student worked on her own project. Vicki, Jasna, Ruth, and Elaine had coats or jackets already underway and some of them were finished when they left. Robin had a pair of slacks and tee shirt fitted and left with a completed outfit. 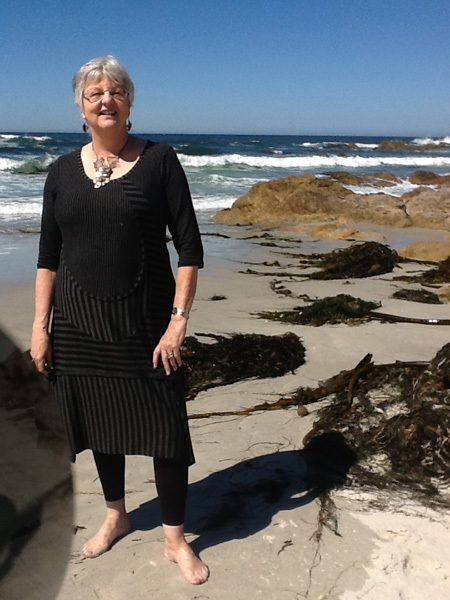 Maria achieved a fantastic fit on a pair of pants and then worked on a skirt and a dress. 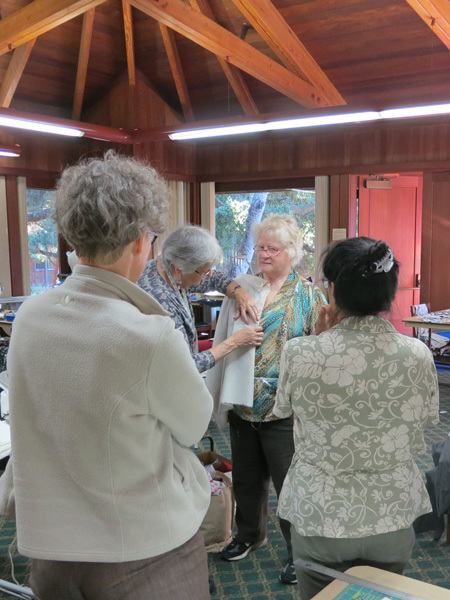 Winny made a beautiful dress, and Sharon S treated everyone to a show and tell of recent garments. Some of us enjoyed going with Barbara to Back Porch Fabrics to choose border fabric for her beautiful quilt. Betty finished her dress and jacket, worked on a quilt, and had pants fitted. Sharon K stayed busy sewing pants and tee shirts. 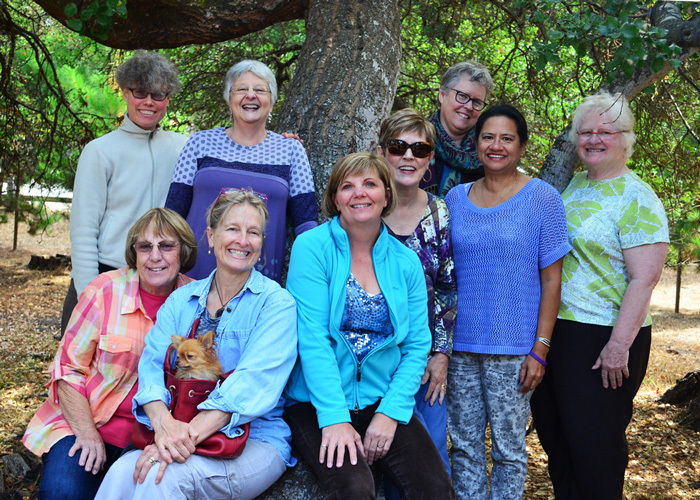 With the new cafe open at Asilomar some of us relaxed even more with a glass of wine in the evening. We were also invited for wine at Maria's new home in Pacific Grove were we enjoyed seeing her artistic decorating touches and meeting her little dog Pippen. Jane had an interesting project for the students who wanted to participate. She demonstrated how to drape a front and back bodice pattern or moulage in muslin fabric. Students then worked in pairs and draped each other. They all had fun doing this ; it was different and made a break from their own projects. Everyone thanks Jane for a wonderful vacation and sewing workshop.